Today (May 25th) is international towel day, a celebration of the life and works of Douglas Adams, author of the Hitchhiker's Guide to the Galaxy series of books. 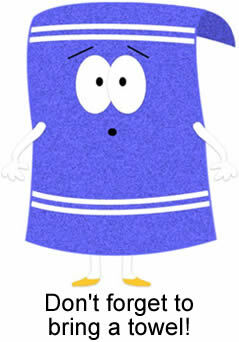 Towel day was first celebrated in 2001, two weeks after his death date of May 11. On this day, fans carry around a towel in order to honor this man and his wonderful works of literature. In the immortal words of towelie from South Park.... "Don't forget to bring a towel!"